This weekend the hubs and I got the chance to have a mini-vacation. 24 hours away was a welcome change of pace. 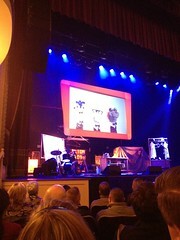 We drove up to Worcester (wuss-tah), MA to catch Alton Brown’s Edible Inevitable Tour with friends. Of course I brought my knitting, my Personal Sock Club – February Edition socks. These socks are plain vanilla toe-up style, but were perfect for working on during the show. We had pretty good seats (Row E, House Left) and the lighting was pretty good too. Lucky for me, my husband & friends were ok with me knitting during the show. I was also not the nerdiest person there with my knitting! I made really good progress. The photo of me with the Alton Brown poster was before the show started, and I think I have maybe half an inch or so to go before the heel turn! We didn’t make into the audience group shot, but it’s still pretty cool!